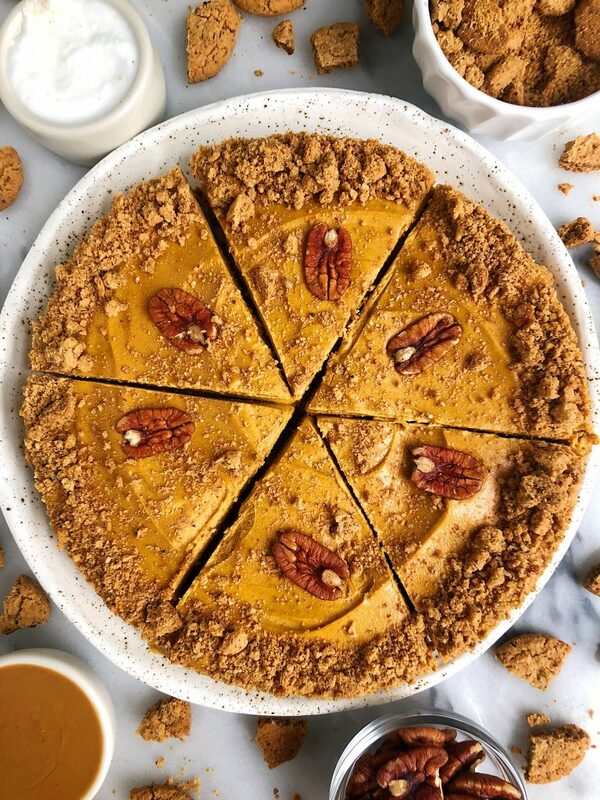 Grain-free Pumpkin Peanut Butter Pie with Cookie Crust for a delicious and easy no-bake homemade pie filled with delicious peanut buttery pumpkin flavors! I have been sharing recipes on the blog for almost four years now. Why has it taken me this long to make a homemade pie recipe?! I will forever be perplexed about this. Sure, we have Chocolate Chip Cookie Pie and a handful of other cakes and such but as someone who loves pumpkin pie pretty much any time of the year, I’m speechless that I haven’t never made one for you guys. 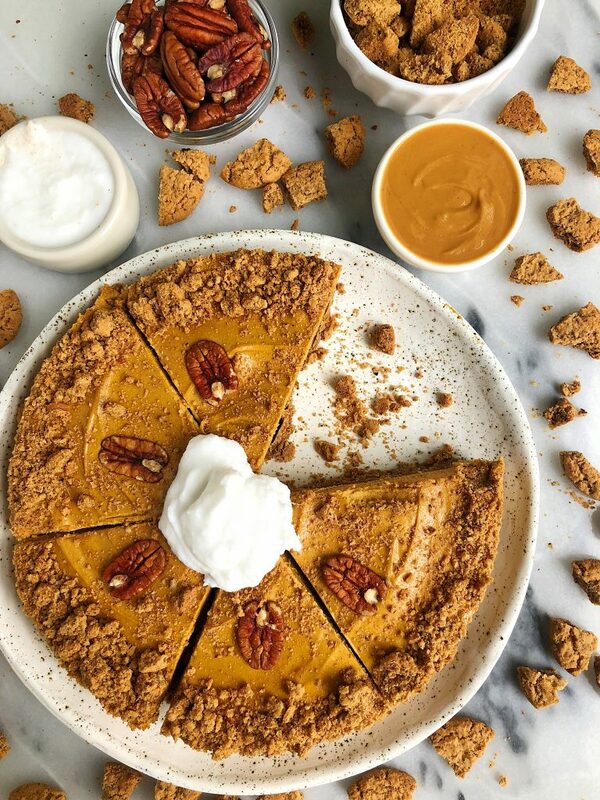 This Grain-free Pumpkin Peanut Butter Pie with Cookie Crust is hands down one of the best pies I have ever eaten though. I don’t like to toot my own horn but after epically failing trying to make a “healthier” pumpkin pie a few times, when this one finally came out I was ecstatic. Not to mention it isn’t just a pumpkin pie but also has the creamy peanut butter texture and flavor combined with a cookie crust. Absolutely unreal. After you take your first bite, you will know exactly what I am talking about. The toasted pecan cookie crust topped with a creamy pumpkin peanut buttery filling that is just the right amount of sweetness. Plus there is no baking necessary for this pie. Just your food processor and a freezer to let it set a bit. The cookie crust is made out of Simple Mill’s Crunchy Toasted Pecan Cookies. We made a yummy crust with their soft-baked variety a few months ago, so I’m excited to have an option using their crunchy cookies now. Their pecan ones are perfect for a fall-ish pie since the pecan compliments the pumpkin flavor oh so well. You guys know my love affair and obsession with Simple Mills by now but incase this is your first time hearing about them, here’s the run down. 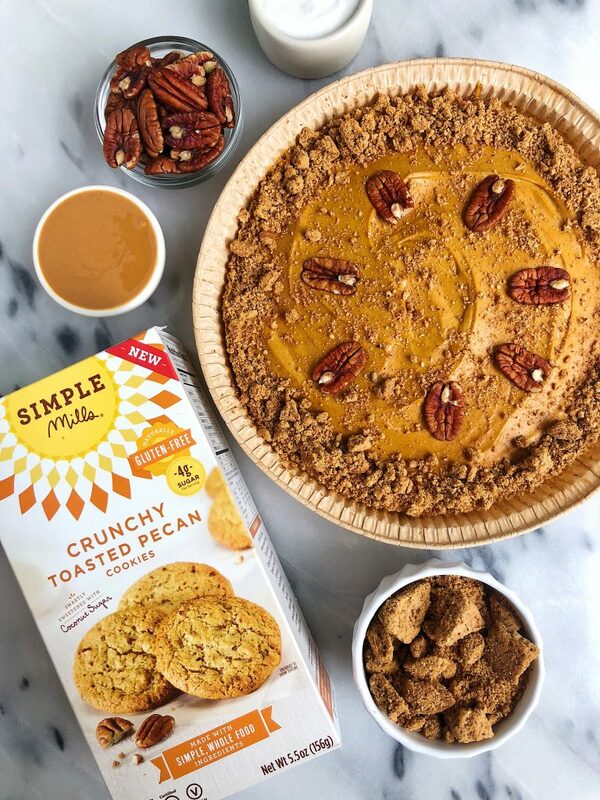 Simple Mills makes a variety of grain-free and refined sugar-free baking mixes, ready-to-eat cookies and crackers. They use ingredients similar to what I bake with like almond flour, coconut sugar, tapioca flour, etc. AKA all real food that actually tastes good. Simple Mills was one of the first brands I started eating when I entered the blogging space. I always joke with their social team how I am a groupie of theirs. There isn’t a product they make that I won’t eat. Especially the pizza dough (omg so good) and turning them into bagels – YES! Here are a few of my other favorite recipes on the blog featuring Simple Mills:Dark Chocolate PB Pie Bars, Crispy Peanut Butter & Jelly Stuffed Waffles, Gluten-free Blueberry Pancake Scones and Zucchini Bread Brownies. Don’t forget to share this pie with me on Instagram if you make it too! Perfect to bring to a holiday get together or let’s be real, on a random day your craving some pie. Even if it’s you solo at the kitchen table like I am right now eating a slice. Thank you Simple Mills for partnering for this recipe! It means so much to me to work with brands I love and believe in!